Im trying to give a sound a rising and lowering effect with SV Filter 1 and i'm not sure how to do it. I thought it would work by turning the knob while recoding but im not sure how to put in onto a bank with a rising and lowering effect. please help! By rising and lowering do you mean in volume ? Do you mean the filter built in to the sampler, or the SV filter effect ? Either way you are going to want to record it as automation. I will do you a quick video if you explain a bit more what exactly you want. The main thing you need to know is that automation will not record unless you enable 'record automation' from the transport bar at the top of the screen. Either 5pin or me will make you a short video later on. Yes 5pinlink, rising and lowering in volume. please may i see the video? 01:12 - Most users expect the recorded automation to be stored in the PATTERN AUTOMATION... but it's empty! Why is that? 01:33 - I try using the shelf tool to adjust my automation data, but the grid/resolution is set to 1 bar, so the control is not precise. I could change the grid/resolution settings, but instead I switch to the slope tool and draw some perfect slopes between the 4 downbeats. 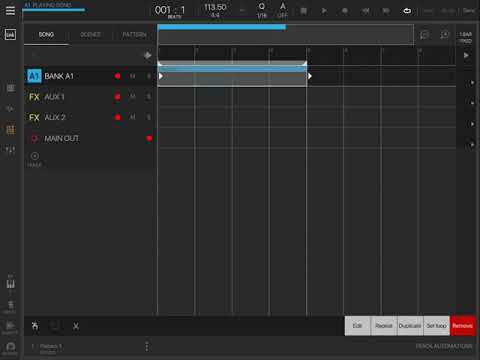 02:18 - I delete the TRACK AUTOMATION and put the pattern in loop mode so that if I re-record the autmation it will be stored inside the pattern (instead of on the track lane). 02:35 - ..but there is a problem!! the pattern keeps restarting after one bar!? this is because I forgot to set the length of my pattern correctly! Doh! 03:00 - this time it works correctly, and I record 4-bar cutoff automation inside the pattern. thanks so much @tk32 !